Location: Winchester Pike at the intersection of Ebright Road and Shannon Road. Description: Intersection improvement with a new traffic signal and left turn lanes. Status: The project is in the final stage of construction with all lanes and the new traffic signal in place. Project cleanup and finalization will continue through August, weather permitting. Traffic/Detours: No additional detours are anticipated. Motorists are advised to drive cautiously during construction activity. Contractor: Double Z Construction Co. 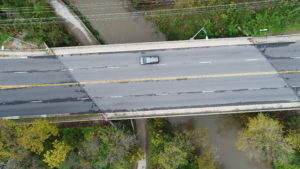 Location: Livingston Avenue over Blacklick Creek. 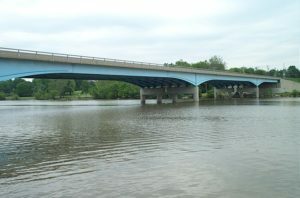 Description: Rehabilitation of the existing 3 span bridge constructed in 1974. The project will replace the concrete deck, repaint the steel beams, and upgrade the concrete abutments. Status: Work is beginning and will last through November, weather permitting. Traffic/Detours: The project is broken up in phases with traffic maintained on Livingston Avenue. Contractor: Shelly and Sands, Inc. Location Big Run Road between Harrisburg Pike and Gantz Road. Description The project will rehabilitate the steel beams, concrete deck and abutments on the bridge over Big Run. Status Construction began on June 5th with the closure of Big Run Road. The bridge rehabilitation project will continue through late summer. Thank you for your patience. Detour The posted detour route for eastbound motorists on Big Run Road will follow Harrisburg Pike north to Frank Road, east to Gantz Road, south to Big Run Road. Westbound motorists will follow the same detour in the opposite direction. Contractor Complete General Construction Co. Description This roadway project began June 20, 2016 and was completed in June of 2017. 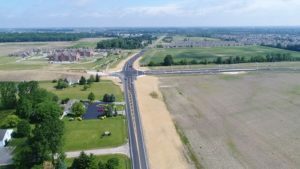 The roadway construction extended Riggins Road to connect Wilcox Road to Avery Road. 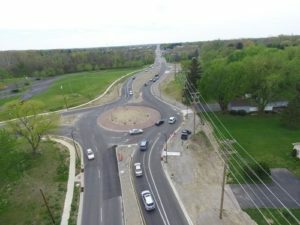 The new road includes the construction of a modern roundabout at Riggins Road and Wilcox Road along with a new water main, sanitary sewer improvements, a shared use path, and street lighting. Status Riggins Road was opened on June 7, 2017. Contractor George J. Igel & Co., Inc. Description The project is entering the final phase of construction. The roadway shoulders and approaches are being fine graded and seeded. Crews will install final pavement and striping on Hamilton Road. Status The project is progressing into the final phase of construction with traffic running on an intermediate layer of permanent pavement. 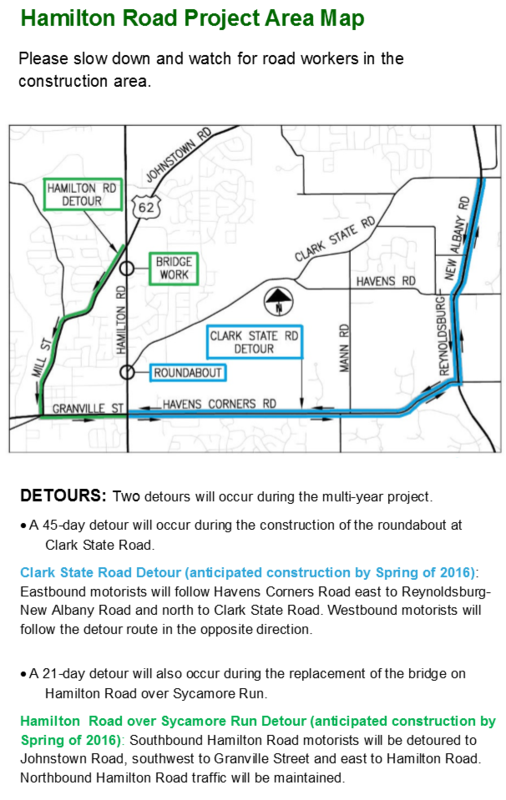 Construction on the Hamilton Road project began June 22, 2015 and will continue until the fall of 2017. Traffic Motorists are advised to drive cautiously and expect slower than normal traffic and possible delays. Contractor Shelly and Sands, Inc. 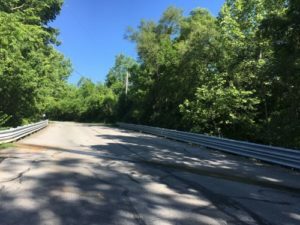 Description The project includes bridge repairs including concrete patching and expansion joint replacement on various structures throughout Franklin County Ohio. Traffic Maintenance Two way – Two lane traffic will be maintained during work hours. Traffic Maintenance Two way traffic will be maintained. Time of Lane Restriction work zone will be present 24 hours a day. Time of Lane Restriction work zone will be present from 9:00 PM Friday through 5:00 AM Monday. Traffic Maintenance Rohr Road will be closed and a detour posted. Westbound traffic will travel south on Shook Road, then west on London Groveport Road, then north on Lockbourne Road to Rohr Road. Time of Lane Restriction work zone and detour will be in effect 24 hours a day. Detour All project locations will have lane closures to enable crews to make the needed repairs. Only Rohr Road will be closed during construction. 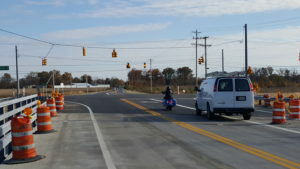 The posted detour route for westbound motorists on Rohr Road will follow Shook Road south to London Groveport Road, west to Lockbourne Road, and north to Rohr Road. Eastbound motorists will follow the same detour in the opposite direction.